How Does Toronto's 2014 Budget Affect the TTC? Photo by Ben Roffelsen, from the Torontoist Flickr Pool. Toronto may crow about its good debt rating and booming economy, but its transit system is in trouble. Service is more crowded—when it runs at all—thanks to flatlined subsidies and relaxed loading standards that stuffed more riders into fewer vehicles. Major repair and renewal projects are starved for funding while politicians woo voters with expensive new subway lines. How much does the City of Toronto’s budget for 2014 attempt to do about all this? In short, not much. There are actually two City budgets: operating and capital. 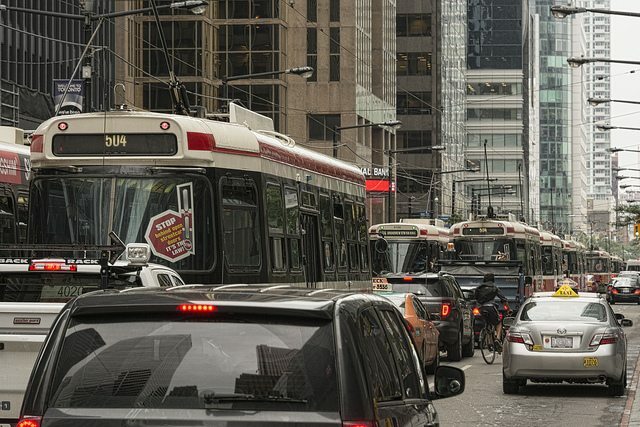 The City’s operating budget includes the TTC’s annual subsidy, which helps to pay for the day-to-day expenses associated with running and maintaining the transit system. These costs are mostly covered by fares, but the subsidy makes up the rest. The City’s capital budget pays for new vehicles and lines (such as the Spadina subway extension to Vaughan) and for major repairs or replacements of vehicles, stations, tunnels, and other long-lasting infrastructure. The budget for some projects is partly covered by other governments, but for others the City funds 100 per cent. The City’s expenses are expected to total $9.6 billion for 2014, and the TTC is about one sixth of that. However, riders pay a substantial chunk of this through the fare box. (Advertising and rents on TTC real estate make much smaller contributions.) After a small provincial gas-tax subsidy, the remainder is left to the City tax base to pay for. For Wheel Trans, there is no subsidy from Queen’s Park. On January 1, 2014, the price of an adult token will go up by five cents, and the price of an adult Metropass will rise by $5.25. Mayor Rob Ford, in his remarks at this week’s budget presentation, attacked the higher pass cost. He compared it to the Vehicle Registration Tax, which he and council killed off in 2011. Ford seems primed to fight against the higher-priced passes, although it is uncertain why, and what alternatives he might propose. Ford missed the fact that this increase has two components. Roughly half comes from the higher token fare applied, pro rata, to the value of a pass. The remainder comes from upping the “trip multiple” of an adult pass to 49, from 48, tokens. This means that each Metropass is now considered to be the equivalent of 49 trips for pricing purposes, rather than 48. This year’s proposed City subsidy—in other words, the amount of taxpayer money the City expects to give to the TTC—is $428 million, which is $6 million short of what the TTC had initially asked for. The TTC will have to reduce its budget to meet that shortfall, and it’s not yet clear how the agency will go about doing that. How much this will affect the TTC remains to be seen. The TTC’s official position is that it accepted the cut. After the TTC board meeting on November 20, TTC Chair Karen Stintz said that she would work at council to obtain the extra $6 million in subsidy. That extra subsidy would require a 0.25 per cent residential property tax increase, meaning it’s sure to run straight into the Ford “Gravy Train” rhetoric, not to mention competition from other councillors’ budget requests. Stintz didn’t include this $6 million request in the TTC board’s budget submission, and her support for it may be feigned, or in any case doomed to failure. Ford tells anyone who will listen about the “billion-dollar savings” his administration supposedly achieved in the current term. (Ford’s billion-dollar figure is widely regarded as a gross exaggeration.) Of this, $74.3 million came from flatlined TTC subsidies, and a further $4.6 million comes from Wheel Trans. Poorer service and greater crowding were a direct result. Operating budgets are often compared to the rate of inflation, even though an agency with growing demand, like the TTC, must absorb the compound effects of higher costs and the need for more service. The inevitable result is that transit is underfunded each year, while politicians brag about savings. Looking ahead to 2015 and 2016, the city manager is counting on annual ten-cent fare increases to provide $40 million in new revenue for the TTC each year. This won’t cover the projected cost of serving growing demand on the TTC, nor will it provide the extra funding needed to return transit service pre-Ford-era service levels. The debates about higher TTC subsidies and service quality are far from over. The TTC capital budget places huge demands on the City, because both the provincial and federal governments have abdicated responsibility for transit funding. Many provincial and federal programs were established when times were good, but almost all of them had sunset clauses, and the City is left with much of the load. This may seem odd in an era when governments promote billions in funding for many transit projects, but most of this is for additions to the system, not to maintain and improve what Toronto already has. The only ongoing revenues are from provincial and federal gas taxes, and these are not inflation-linked, causing a long-term decline in their value. Toronto uses just over half of its provincial gas-tax revenue for the TTC’s operating budget and the rest ($60-70 million) goes to capital. All of the federal government’s contribution (about $150 million) stays in the capital accounts. Considering the fact that the TTC’s capital repairs and renewal require $900 million annually, the two senior governments are not pulling their weight. One possible revenue source will be the local share of any new Metrolinx “Investment Strategy” money—that is, money raised through new, transit-specific taxes and fees—but Toronto can’t count on this until cheques start to arrive. Although property taxes mainly fund the TTC’s operating budget, they also fund the City’s share of capital projects, either through “capital from current” payments, debt financing, or reserves. By paying some capital costs out of current tax revenue, the City avoids interest costs. Debt is used for some financing to spread the cost out over many years—although then, of course, the City has to pay interest. Reserves, built up from previous years’ revenues, are normally earmarked for specific classes of spending. The TTC has a $9.1 billion need for capital investment over the next decade. This does not include any of the major projects that Metrolinx has in its “Big Move” plan (i.e., the Eglinton-Crosstown light-rail line), nor does it include the Scarborough Subway. In discussions between the City staff and the TTC, this has been whittled down to $6.3 billion, but in the process many items have been deferred or placed “below the line” while the City waits for new funding. This includes many projects related to growing demand and service improvements. It may appear that TTC spending is manageable, but that’s only true if we pretend that one third of its capital needs can, for the moment, be swept under the rug. The Scarborough Subway, recently endorsed by city council, makes its first appearance in the 2014 budget, long before anyone will ride the trains. At $3.437 billion over the next decade, the project raises the TTC’s total capital spending by over 20 per cent compared with previous budget estimates. This distorts some of the year-over-year comparisons. The “state of good repair” (SOGR) backlog is normally compared to the value of all capital assets, and a rising percentage is a bad sign. However, the Scarborough Subway is such a large new city asset that it dilutes the apparent size of the backlog. In the early 2020’s, the projected SOGR percentage falls even though the repair backlog, notably on local roads, will continue to grow. City capital spending, originally planned to be on a long decline after a high point in 2014–15, now has a “hump” in 2020–21 when construction work on the new subway will peak. Spending on subway debt will push the City’s financing charges closer to 15 per cent of its total tax levy, which is the City’s target debt ceiling. This reduces the headroom available to take on more debt or to absorb any long-term increase in financing costs. Choosing to build a new subway is what has brought about this loss of flexibility. Of the expected $64 million rise in residential property taxes for 2014, $13 million (a 0.5 per cent increase) is the first stage of the new subway tax. This is slated to go up another 0.5 per cent in 2015, and then 0.6 per cent in 2016. Non-residential taxes for the subway will go up by only one third of this amount (0.167 per cent). (Commercial properties benefit from a long-standing council and provincial policy to rebalance the tax load carried by businesses with that carried by homes. This situation will continue to 2020, when Toronto’s ratio of residential to non-residential tax rates will match that of the rest of the Greater Toronto Area.) In brief, homeowners will pay the lion’s share of the new subway tax. 1 The reserves come from the subway tax that is collected starting in 2014 before the bulk of spending is actually needed for the project. Once this reserve is used up, the City will use debt to finance the remainder of its share. 2 Interest estimated on 25-year amortization at 4 per cent. The absence of federal and provincial funding guarantees beyond the usual gas tax transfers will leave city council with two options: big transit-related tax increases, or limiting the growth and convenience of transit within the city. As part of its 2014 budget approval, the TTC board proposed a joint initiative with council to lobby both levels of government for better, sustained transit funding. But council has other portfolios—such as housing, child care, and infrastructure repairs—that need money, and these will compete with transit for political attention at all levels. Several possible improvements to the TTC are not covered by the current budget projections. This leaves us with some unanswered questions. What will be the cost of serving growing demand for transit throughout Toronto? The 10-cent fare increases proposed for 2015–16 will not cover all of the TTC’s budget needs, and yet political pressure may limit fare hikes to 5 cents or less each year. A 10-cent increase generates about $40 million annually, enough to cover an inflation rate of 2.5 per cent, but with no provision for growth. When the Spadina subway extension to Vaughan opens, fare revenue will not cover the added operating cost. Will council up the TTC’s subsidy to cover this new cost, or will service growth elsewhere be limited? Will council pursue improvements beyond basic system growth, such as a return to pre-Ford service levels, or the implementation of a core network of frequent and express services like the Transit City Bus Plan? In 2012, the TTC saved about $14 million by allowing greater crowding under its service standards. Undoing this would cost at least as much, plus capital spending for a larger fleet and garage space. Should Wheel Trans remain at its current service level, or should it be improved to handle additional types of riders and provide better “on demand” availability? The implementation of the PRESTO smart card will bring the end of TTC transfer rules as we know them, and will probably usher in time-based fares, such as those on some transit systems in the 905 region, as well as on the 512 St. Clair streetcar. The TTC’s estimate for the revenue loss associated with a two-hour fare is $20 million per year. How will the city compensate for this? Integration of fares between GO and TTC would result in lower overall revenue for the TTC. How much is city council prepared to pay to make GO an integral part of the transit network within Toronto? Should regular fare increases cover at least the cost of inflation, or should subsidies rise so that fare revenue can fall back to a target level matching past years? Once this target is reached, can artificially low fare hikes be justified? Should low-income groups receive extra subsidies through TTC fares, or should this support be directed to them through other programs? The TTC’s capital projections exceed available funding by $2.7 billion over the coming decade, but this amount doesn’t cover all of the agency’s needs. Major projects, such as the proposed Richmond Hill and Relief Line subways, are part of the Metrolinx Big Move plan, but it’s unclear whether these will be 100 per cent financed by senior governments or if, like the Scarborough Subway, a municipal contribution will be required. The budget contains no provision for this, nor for $450 million worth of station improvements, nor $385 million worth of accessibility projects. Capital spending over the next decade is crowded by the combination of the Scarborough subway and the City’s own target debt ceiling. Without additional funding, not only will the TTC be unable to keep up with expansion demands, its “state of good repair” backlog will be $338 million by 2023. How will this be dealt with? Proposed funding through the Metrolinx Investment Strategy could bring about $150 million annually in new money to Toronto, provided that Queen’s Park opts for the full, proposed $2 billion-a-year Metrolinx plan. Should some of this money go to non-transit projects, such as the Gardiner Expressway? Some programs, such as Ottawa’s Economic Action Plan, require municipal cost sharing. Even if Ottawa comes to the table, Toronto may not get project funding without an investment of its own. Will the City be willing to put up some money? The city council elected in October 2014 will face major decisions about transit funding that are only hinted at by this year’s budget presentation. Many councillors claim to be pro-transit, but their support can be highly selective, depending on political goals and competing priorities in other portfolios. Will their support fade when they confront the cost and tax implications, or will they view transit improvements as investments in the city’s growth and attractiveness? Transit spending problems will not go away just because Toronto has a mayor who ran on a platform that included lower taxes and free subways. The next administration must confront a backlog of demands for better services and more infrastructure, and must be prepared to justify this added spending to voters—preferably by delivering real results transit riders can see and enjoy.